In this section, you will learn how to implement data validations in the ASP.NET MVC application. We have created an Edit view for Student in the previous section. Now, we will implement data validation in the Edit view, which will display validation messages on the click of Save button, as shown below if Student Name or Age is blank. ASP.NET MVC uses DataAnnotations attributes to implement validations. DataAnnotations includes built-in validation attributes for different validation rules, which can be applied to the properties of model class. 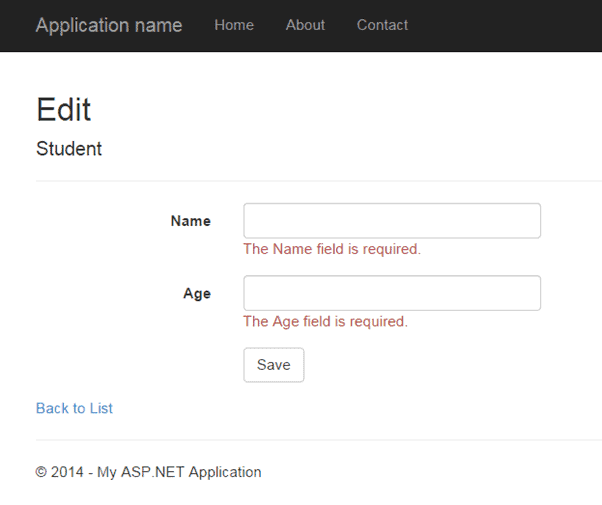 ASP.NET MVC framework will automatically enforce these validation rules and display validation messages in the view. The DataAnnotations attributes included in System.ComponentModel.DataAnnotations namespace. The following table lists DataAnnotations validation attributes. Let's start to implement validation in Edit view for student. Step 1: First of all, apply DataAnnotation attribute on the properties of Student model class. We want to validate that StudentName and Age is not blank. Also, Age should be between 5 and 50. Visit Model section if you don't know how to create a model class. You can also apply multiple DataAnnotations validation attributes to a single property if required. In the above example, we have applied a Required attribute to the StudentName property. So now, the MVC framework will automatically display the default error message, if the user tries to save the Edit form without entering the Student Name. In the same way, the Range attribute is applied with a min and max value to the Age property. This will validate and display an error message if the user has either not entered Age or entered an age less than 5 or more than 50. Step 2: Create the GET and POST Edit Action method in the same as previous section. The GET action method will render Edit view to edit the selected student and the POST Edit method will save edited student as shown below. As you can see in the POST Edit method, we first check if the ModelState is valid or not. If ModelState is valid then update the student into database, if not then return Edit view again with the same student data. ModelState.IsValid determines that whether submitted values satisfy all the DataAnnotation validation attributes applied to model properties. Step 3: Now, create an Edit view for Student. 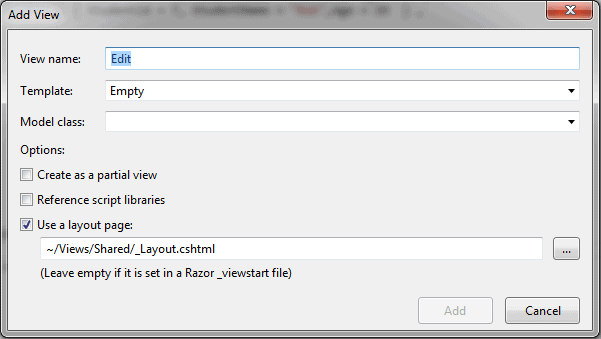 To create an Edit view, right click inside Edit action method -> click Add View.. Select the Edit template in the Template dropdown and also select Student Model class as shown below. Now, click Add to generate Edit view under View/Student folder. Edit.cshtml will be generated as shown below. As you can see in the above Edit.cshtml, it calls Html Helper method ValidationMessageFor for every field and ValidationSummary method at the top. ValidationMessageFor is responsible to display error message for the specified field. ValidationSummary displays a list of all the error messages at once. So now, it will display default validation message when you submit an Edit form without entering a Name or Age. Thus, you can implement validations by applying various DataAnnotation attributes to the model class and using ValidationMessage() or ValidationMessageFor() method in the view. Learn how to implement client side validation in ASP.NET MVC. 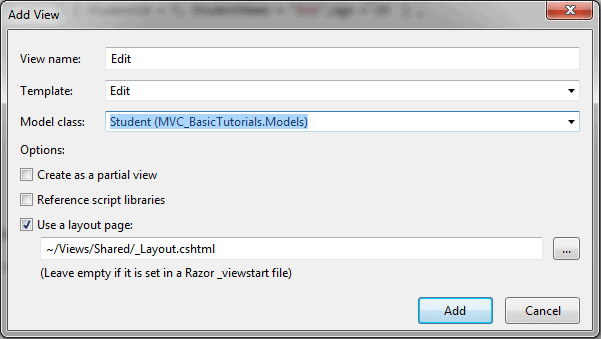 ASP.NET MVC uses DataAnnotations attributes for validation. DataAnnotations attributes can be applied to the properties of the model class to indicate the kind of value the property will hold. Use ValidationSummary to display all the error messages in the view. Use ValidationMessageFor or ValidationMessage helper method to display field level error messages in the view. Check whether the model is valid before updating in the action method using ModelState.IsValid. Enable client side validation to display error messages without postback effect in the browser.